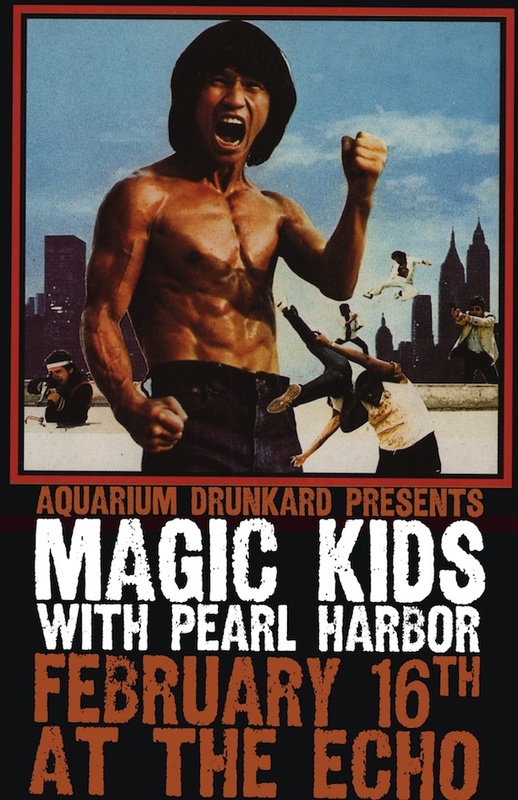 February 16th Aquarium Drunkard presents Memphis, TN’s Magic Kids with L.A.’s Pearl Harbor at the Echo. We’ve got three pairs of tickets for AD readers. Interested? Leave your name, a valid email address we can reach you at and the name of Magic Kids new label (they just signed). They just signed to True Panther. I’m not sure how this works, since now people can read my comment and get the answer, but hey, I’ll do the legwork. True Panther – pitched both these bands at my boss. he dug um. would love to hit up the echo. Magic Kids is signed to True Panther Sounds, who was bought by Matador, which is distributed by The Alternative Distribution Alliance, which is partially owned by the Warner Music Group (the other owner being Sub Pop Records, which is 49 percent owned by Warner, but I digress), which owns Grand Hustle Records, which was founded by T.I., who put out “Whatever You Like,” the only rap song without any rapping. But I want these tickets to see Pearl Harbor. I’d love to be there. Pretty sure Jordan deserves to win after that response.